Opening the PDF files on this page may require you to download Adobe Reader or an equivalent viewer (GhostScript). Opening Microsoft files (winzip, word, excel, powerpoint) on this page may require you to download a special viewer. Or you can download and save the files and use your preferred office applications to view and edit them. There has been a change in the curriculum. The CSE372 class has been replaced by CSE557. CSE557 will also be available for elective credit in the BS and MS degrees. Watch out for a new set of web pages.... [ ../cs557 ] that will need massive editting. Check these out for possible errors [ grading/ ] before I lock them into CMS. There are more seminars on Friday 9th to make up for points lost prior to the final. The deadline is passed for the last project:-( Did I loose two? I hope to post first cut grades on thursday or friday. watch this page. The final will be on Tuesday from 4pm-5:50pm -- see the class schedule for the quarter. The structure will be close to the [ mock.html ] and the questions close to previous [ finals.html ] for this class. Bring some blank paper to write your answers on! At least 8 pages, possibly more if your writing is large. Today each team must present their work. Hardcopy can be delayed if we spot errors. The presentations will be cancelled and you'll EMail me a short question or message with CSE372 in the subject to earn credit. I will assign the same score to the presentation as to the hardcopy of the project submitted in my office hour next Tuesday Dec 6th. Today is the 19th class of 20... [ review.html ] [ project5.html ] and I will show videos on making presentations and will then review your project, face to face, with each team. Bring a single question you would like answered before the final on a piece of paper with your name on it. I will try to get them answered in class or on this web site. [ watch?v=liQLdRk0Ziw ] the 10-20-30 rule for pitching an idea to a venture capitalist. 10 slides + 20 Minutes + 30 Point font. [ watch?v=6tGq3tH4qSw ] (Don McMillan). Prepare for today's class by studying [ r3.html ] (SDS). As usual one Review qn+ans is handed in. There will be a quiz on this material. Next Tuesday is a course review [ review.html ] and project work. Bring a question you need answered to class! You should study [ r2.html ] which is all about software requirements and the modern way to write them -- Use Cases. These are a way of organising what a piece of software needs to do and also the process of producing it. At the end of the class tou will be working on (1) improving your project documentation (I will hand back marked up work) and (2) moving on to the next iteration. See [ project4.html ] for the details. Each team needs to submit the latest iteration [ project3.html ] of their projects -- data definitions! There will be a quiz where you will have to express a complex rule using one of the techniques in the above notes, and also draw a small ERD. All computer suystems are about data. The question is -- what form of data is maintainable. It turns out that when data is in Normal Form it has fewer anomallies and has some standard tools and languages to help implement it. Prepare for today by studying [ d4.html ] and doing the review questions. Hand in a question and an answer at the start of class. You can also hand in a sample of data with your name on it -- this is one of the review questions/exercises. We will do some normalisation in class as exercises and then you will have class time to work on [ project3.html ] which is due at the start of the next class. The next class is about rules and procedures: study [ r1.html ] to prepare for next Tuesday. Small schedule change [ schedule.html ] I've move some project time from the end of class 18(Tues 22nd) to class 19(Tues 29th). Today you should have prepared by studying [ d3.html ] (Entity Relationship Diagrams) and completing Thursdays emergency take home quiz. You should hand in a Review Qn+Ans plus the quiz at the start of class. ERDs are a simple and expressive way to capture the ideas in stakeholder's minds -- those things that they want the system to remember. They express a methematical model of the world that the stakeholders are interested in. The complement DFDs by documenting the detailed content of data stores and data flows. There will be a quiz on ERDs at the end of the class. The next step in the project well require details on all the data in your design. The next topic -- normalization [ d4.html ] -- is the most useful tool in a system designers toolkit. It lets you go from samples of data (in the old or new system) and deduce a data base that supports them. Please bring some samples of data to class 15 on Thursday. This comic [ http://xkcd.com/974/ ] perfectly describes a common error newbies make when doing systems work -- not being specific. Let me know [ contact.html ] if you have any suggestions or comments. I will be putting up PDF versions of the web pages on this web site for people with e-readers. When the alarm went off and we were evacuated I handed out the quiz to be done as a take home quiz. Please work alone but you can use notes/web pages/handouts. Hand in with the next Review question+answer on Tuesday. I posted the latest grades last night... I will be handing back the last quiz and project today. Today we study the ways of encoding and parsing data -- study the handout and [ d2.html ] and do as many review questions as you can. Hand in one Qn+Ans at start of the class. The class ends with a brief introduction to conceptual ERD modelling using the UML [ d3.html ] and the next step of the project [ project3.html ] and quiz 7 on encoding and parsing data. I have just created a [ calendar.html ] for this class.... what do you think of it. By the way, when I generated the calendar I discovered some small errors about "Tu" and "Th" in the [ schedule.html ] which I have corrected. This is a particualr example of a common pattern -- changing the format of the data exposes different errors. You can improve quality by looking at data in many different formats. Please study [ d1.html ] and do as many review questions as you can before the start of class. Hand in at least one Qn+Ans at the start of class. Also each project team must submit their [ project2.html ] so that I can grade it ready for Thursday. There will be a quiz on todays topics. There will also be a special (hardcopy) handout for you to study as part of the assigned reading for class 13 on Thursday. Study [ c3.html ] (local) and [ PERT ] (Wikipedia). Do as many review questions as you can and hand in just one with its answer at the start of the class. During class we are going to do several PERT/CPM/Network planning exercises. The class finishes with starting the next iteration/phase of the project [ project2.html ] where you demonstrate its financial feasibility. This work needs to be completed as assigned work and handed in for grading in the next class on Tuesday November 1st. I expect you to hav studied [ c2.html ] on development strategies. I expect you to be ready to do exercises and to do a quiz on the topics in this page. Alos bring one review question and an answer to class. I do not want a tidy and sanitized report this time. Just your notes. Sunny just Emailedme his slides [ CSE_presentation_updated_09272011.pptx ] , Enjoy! I've put several tables of grading data in [ grading/ ] ready for you to review. This includes a special table of bonusses and when they were earned and the summary sheet where the bonusses are added in to the pre-final score. 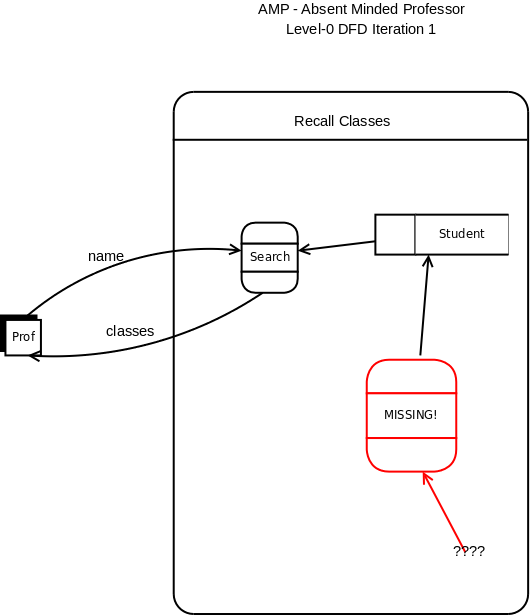 Study [ a5.html ] to learn about non-diagramatic ways of documenting and describing systems. This includes scenarios, data dictionaries, glossaries, prototypes, and lots of other techniques. They complement DFDs and ERDs. As always tackle as many review questions as possible and be ready for them to turn up in class as exercises (and on quizzes and the final). Hand in one review Question and Answer at the start of the class for instant grading.. I will introduce the third virtual field trip at the end of the class. Please study [ c1.html ] (Choosing a Project Part 1), do the review question and bring one+answer to class. Also I'm expecting your second field trip report. You should all prepare some question to ask and hand one in to me at the start of the class. I expect each project team to hand in a [ project1.html ] preliminary project scope (who is doing what). On Tuesday we will be reviewing ERDs and DFDS. Please study [ a4.html ] and make sure tou understand the different types of diagram and how they are drawn. They will be on a future quiz, they will be on the final, and you will be using them in your projects. Do the review questions and hand in at least one (with answers) before the start of the class. A rain in Sierra Hall has caused shut-down of all phone and data communications in Sierra Hall. Thanks to quick work from Facilities Services, the water leak has been diverted from the network equipment in Sierra Hall. The switches are currently powered down, and drying out. TNS staff will attempt to restart the network connections for voice and data about 7 AM on Thursday morning. Please study this page [ a3.html ] on Systems Architecture, and do as many of the Review Questions as you have time for. Bring at least one review question and your answer to class. Bad situations [ 174559 ] (Infoworld) and how to avoid them! Next class is a field trip -- bring questions and meet i the class room promptly. I expect you to studied the reading [ a1.html ] on Systems Theory, done the review exercises and handed in one of them. There will be a short lecture and lots of practice on the materials. After I introduce the next class there will be a 20 minute quiz to end the class. Systems: Campus web server, Meeting Maker, GIS, Class Climate, HEAT, Cumulus (photo server), Navsea (media stream server). Message: The servers will receive the security patches for system updates on Sunday October 2nd 8:00 am - 12:00 pm. Estimated patch time is 4 hours Impact: During the update process the above systems, will be temporally unavailable. [ schedule.html ] [ syllabus.html ] [ ../syllabus.html ] (They include links to TXT and PDF versions for downloading to ebooks and dumb terminals). Other than the inevitable errors and disastors, this [ schedule.html ] is the schedule for this class this quarter. I will be going through the older postings and either deleting them, shortening them, or moving them into the readings. I simplified the header/navigation by putting the reading in [ readings.html ] a separate file. From now on as I work on each page it will be given the new format. Also putting a quick list of links at the end of each page. By reviewing the online syllabus [ syllabus.html ] (corrected 10:35) and adding a couple of examples of systems misbehaving. As in previous years we will not have a text book but instead study designated pages on the Web. I have started adjusting the schedule [ schedule.html ] to the calendar for 2011... but it will have errors and has at least one, as yet, unknown date. I am not making a big change but switching the content of the 3rd and 2nd classes around ready for the next time CSE372 is taught -- hopefully Fall 2011. Look at [ grading/ ] and let me know ASAP of any errors or omissions. I've graded the final and published draft grades [ grading/ ] for the course. I will review these for errors and extra bonusses on Monday. It is still possible add bonusses to the total before the final -- until you hit 300 points (the max). There are 4 seminars on Friday. I'm waiting on getting all the hard copy projects in. One team to go at the last count. Thank you for some interesting question at least two of them will lead to a better experience for future students. By the way -- I have indexed all the questions and the search at the top of the page will list the relevant questions along with other relevant items on the web sight if you supply a word or acronym or phrase. Judging by the grades that I just posted [ grading/ ] a number of people will benefit by attending the seminars and writing a brief report -- 5 points per seminar. Great work -- no points were lost. Your questions will be answered (I hope) in [ questions2010.html ] shortly. We now have two seminars on Dec 3rd and two on Decemeber 10th. Please check [ ../seminar/ ] for details and later announcements. I've just posted the latest [ grading/ ] so you can check it out. The next piece of reading is [ r2.html ] on use cases and requirements. The usual Review Qn+Ans is expected on Tuesday. On Tuesday I will rerun the marked up and graded projects, so you can start on the next phase. I'll also be handing out the Thanksgiving take home quizzes. You can download [ 17r2Q10.doc ] which is a MSWierd "doc" file that can be used as a template for the answers. Thursday class [ r1.mth ] (rules, procedures and algorithms) including a quiz. The next class will be on Tuesday and will cover detailed data design [ d4.html ] (hand in a review Qn), and will also start the next iteration [ project3.html ] of the project. The next class relies on you studying [ d3.html ] and doing the review questions. There will be a quiz on ERDs at the end of the class. There is a holiday on the next Thursday. After the holiday we meet on Tuesday 16th of November to review normalization and start the 3rd iteration of your project (data defintions). I've just spotted this [ http://www.wired.com/epicenter/2010/11/long-live-design/ ] article on Wired. It matches my thinking on Web design [ d1.html ] which we will discuss in class today. Due in: at least one Review Question+answer from the reading. Each team to submit [ project2.html ] the next iteration of their project. I've decided to add a new simple example of a project. 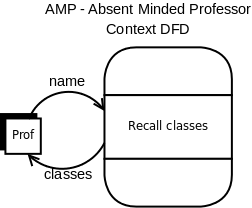 It is called AMP -- The Absent Minded Professor system. 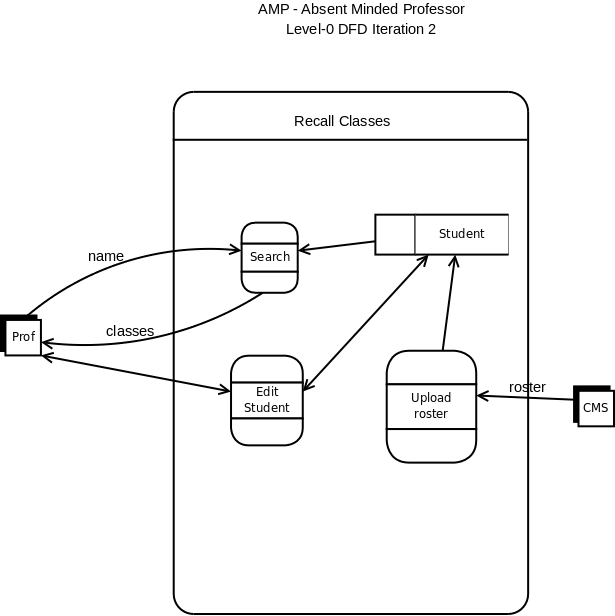 The vision is a simple system that lets a professor recall, quickly, where they taught a student. 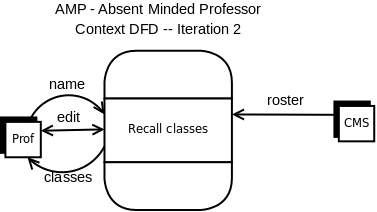 Here is the development as a series if DFDs: [ AMPContext1.png ] (INitial context diagram) [ AMPLevel0DFD1.png ] (Level0 DFD exposes an error) [ AMPLevel0DFD2.png ] (Improved level0) [ AMPContext2.png ] (updated Context). The above will be placed in the DFD notes... and the [ d3.html ] notes will have the ERD. What happens after that is not clear! Next: [ F3.html ] , submit a rough set of notes, no more than a page! 10 point. [ c2.html ] and submit a review qn+ans. [ a5.html ] (reading) plus [ Qa5.html ] (exercises). Next [ F3.html ] (field trip) and [ c2.html ] (Costs, benefits, and implementation options). The reading was [ c1.html ] and I expect one answered review question from it. THe first phase/iteration is due to day at the start of class today. Class exercises will come from [ qc1.html ] (for those with flu...). There is a quiz to handed out and done today. Firstly, I will be giving 5 bonus points if you attend a CSE Club function and sign the sign up sheet. Secondly, thanks to a question from an alert student -- yes you can use a single sheet of notes in the quizzes and final. You can write anything you want on it, in any form, and on both sides. Third: To prepare for the next class study [ a1.html ] and do as many of the review questions as you have time for. Write one Review Question and its answer on a piece of paper and hand it in before the start of the next class. Two people in the class got an A -- well done. Note I had to rescale the total scores because nobody got an 'A' on the raw scores. You will find this escape clause in the generic syllabus [ ../syllabus.html ] for my classes. The previous blogs for this course have been removed.